A game of Yövuoro (The Night Shift). Again, there was a short-form scenario contest at Ropecon. I managed to play in six of them, including all three that received a prize. I gave some feedback to the designers on individual games, but now that I can see the bigger picture, I’d like to point on some commonalities and offer critique that I hope will lead to more fun for everyone in the future. This year, one GM ran each game only once. They only read the game at the table; the rules of the contest stated that the GM should be able to read the game in 15 minutes and the game itself took 45 minutes. First, I’ll go through the games individually; afterwards I’ll talk shortly about some general observations. I will try to spoil as little as possible. Do note that I haven’t read the scenarions and my impressions about the game design are based on what the GMs presented us. The bad translations of the titles are my own ones. Only the top three were ranked publicly. The concept: a Ropecon visitor has been abducted by silly aliens who all want the victim for themselves. I admit that I wouldn’t have picked this at all, but I participated by accident, and despite good company at the table, I didn’t enjoy the game. It was a humor game and that’s a tough genre to pull off. The scenario attempted to do comedy by making the characters very silly. The Ropecon visitor was a normal human whose task was to get to know the prospective adopters and pick his destiny. The least silly of the aliens was only mildly silly, as the player was free to portray it in any way she wanted. My alien had a silly manner of speaking and I had to say GACK-GACK every once in a while. The silliest one had to make faces, speak in a funny voice, and clap hands, and I may even forget something. When I first read about my character’s GACK-GACK, I thought it might be fun. It might descend into a fun, chaotic situation. Instead, the mannerisms turned very annoying very quickly. Even worse, I couldn’t concentrate on producing good ideas and worthwhile dialogue. If the players have to expend energy on making silly noises, they can’t spend it on other fun stuff. There is a small chance that it might be fun with just the right kind of group. The one where everyone likes making fun noises and faces and laughing at it. But writing stuff like that for total strangers who might be strangers to one another is a risk. Moreover, there was nothing in the scenario except the silly characters and the starting situation. The GM had nothing to do after the introduction, there was no twist, there was nothing to spice up the situation just in case or just because. I did like the fact that my character sheet said that my character can be of any gender (instead of “either gender”). Major bad guys of the multiverse in an old folks’ home. Out of all humorous ideas, this one didn’t sound all bad. And I kind of dug it. There were five characters to randomly pick from, four of which were well-known fictitious big bad guys. Each had lost their former powers, except one; in the course of the game, they had the opportunity to regain some of them. The game is set in three days, each of which presents a challenge. You had to use your powers to try to resolve those challenges. The ones that resolved them gained back a power, as did the big bad voted the most big bad at the end of the day. After three days, you could try persuading the director to let you go. Apparently you had to have three powers to do that. The good thing about this was that the main characters were well-known and it was the players’ responsibility to make them fun; that is, the scenario didn’t try to shove jokes down your throat. The quests were open-ended and I found our attempts humorous enough. I also had fun trying to make up bad Lord of the Rings jokes. Structurally, the game was okay. There were three different challenges, some changes to some characters, the cycle between day and night brought some rhythm to the game. I had fun, but fun is always a matter of taste. As a design, nothing much. Real-world fact: Ropecon had to move out of its former location, Dipoli, and it was held in Messukeskus. This game wanted to ask what if Ropecon was still at Dipoli and on Saturday morning, fantasy had become real and the players characters had to save Ropecon. Or something. The concept didn’t appeal to me beforehand, but I wanted to play, so what the heck. I was pleasantly surprised. The game was a welcome nostalgia trip to a place associated with many, many good memories. The player characters were just regular people thrown into extraordinary circumstances; no stats, just your name, age, and a word or three about what you do in life. The humor was meant for veterans of Dipoli only, but the pitch made that very clear. More importantly, the game didn’t try too hard to be funny, but relied on the players own ingenuity in solving quests in ways appropriate to Ropecon. Mechanically, the game had nothing to write to your blog about, although that’s exactly what I’m doing. Each character could carry two items. You could try using those items to solve quests; a roll of D6 resolved the task, with 5 and 6 being successes. If your character was really suited to the task, the chances were better. All characters had five hit points and we were nowhere near to dying when we finished the game. Basically it was a ridiculously rules-lite dungeon crawl / adventure book in Dipoli. Apparently the scenario instructs the players to think up creative and outré solutions, but it felt slightly restrictive to me, as if there were right answers and wrong answers. And now for the spoiler-y bit. The scenario had a definite end, which was a really good thing for a 45-minute thing. But the ending could have been so much better! As it was, we just saved Ropecon and normality was restored. Ropecon went on in Dipoli. I thought it would have been perfectly bittersweet and nostalgic if the characters had been teleported to Messukeskus instead! Now the scenario was a somewhat pointless, although fun adventure. I can’t blame the designer, though: it was impossible to predict what Ropecon in some place other than Dipoli felt like after all these years. The scenario took the second place in the contest. “Four cops try desperately to stop robbing in 1977 New York during a power outage.” That was the pitch. SOLD! Our characters were roughly described with two or three lines of text, which was more than enough. We had four players: Lauri, myself, and two beginners to table-top RPGs. I took a veteran cop with a rookie partner, and played him as friendly toward the rookie and bad against perps. Not James Ellroy bad (at the beginning of the game, I asked what the others wanted and didn’t want at the table), but clearly the bad cop. Lauri was my relaxed counterpoint. We had fun playing out their conflict, and I thought it was fun to instruct the rookie cop and at the same time sort of instruct the rookie player. I hope she found my (figurative) handholding more helpful than intrusive. I think there were no dice mechanics apart from a random encounter table. I don’t think it needed anything much. However, the scenario lacked structure and focus. The cops just parked their cars and proceeded to arresting perps on Broadway, all of which were generated by throwing a d10 on the encounter table. There was one event which felt scripted and it was okay. Other than that, we just encountered some robbers, dealt with them, and proceeded on to the next one. We did have fun, but I think the game would benefit from less encounters with more focus on the remaining ones. Instead of cramming six or seven encounters into 45 minutes, I’d go for one encounter to introduce the characters, then maybe one more “casual” encounter, and then hit the characters with a real challenge: ethical, social, or otherwise. The setting was perfect, the characters great, and we had a great time. Design-wise, it felt it could use trimming and focusing. The scenario came in third in the contest. The game was set in the 1800s in Pohjanmaa, a region in Finland. It’s about powerful families, proud guys with knives, unfortunate lovers and religion, and was pitched as being probably a Finnish take on A Game of Thrones. Apparently, there was nothing pre-written except the mechanics. Normal playing cards were used to create characters and their relationships, very much resembling what you do in Fiasco. Kings were powerful men, queens powerful women, jacks young men; the suits determined the character’s station of sorts: violence, wealth, and so on. For example, the queen of diamonds could be a wealthy matron and a jack of spades a violent young man armed with a knife. Then, aces were placed between the characters and the the suits determined the nature of the relationship between the characters. It was cool, but I was very concerned by this. The GM explaining the rules of the character set-up and the conflict resolution (I’ll come to that in a bit) seemed to take a lot of time. Using a sizable chunk of the gaming time for creating the characters AND the setting was a big risk, especially when the mechanics needed some explaining as well, and each character had two scenes. That meant rules explanation, character creation, and eight scenes (for us) in 45 minutes! As I said before, each character had two scenes. There was a set order in the first round, and then we could do it any way we wanted. In each scene, there was a conflict, and every player had five cards (from two to ten) in their hand. When you played a card, the suit determined the nature of your action: love, wealth, tradition, violence. If someone wanted to resist your action, they had to play a bigger card. When someone played the ten (or the biggest card they had), the conflict was solved. Anyone could join in the conflict, provided their character was there. You could also play any card as 1 of any suit: you wouldn’t win anything with it, but it might suit the fiction better. After the conflict was over, you took a new card for each card you played so you had five cards again. The first scene was mine. I wanted to rob or destroy proof about my guilt, so my priest took direct action and I played the ten of spades. There was no stopping the arson. It set the scenario off to a nice start, but I didn’t yet understand the fun things the mechanics are made for. Namely, escalation! Escalating things with the cards was insanely fun and colorful! Getting things the easy way by playing the 10 as fast as possible wasn’t the important thing about the game: it was all the twists and turns in the interactions between the characters. Miraculously, we built a fun and engaging story in an hour. Out of the games I played, this was the best design and I had most fun with it. I have absolutely nothing bad to say about it, other than it being maybe a bit too much for an hour. I would like to offer some creative criticism, but as of now, I can’t find anything. I’m willing to be that the game will be even better when given two to four hours. This was the winning game. Finnish history isn’t my strong suit. When the scenario is about peace talks in the early 18th century between Sweden and Russia, I’m not too thrilled. Not because I find the subject boring, but because it sounds like it’s too much for what I know. (Just in case you’re interested, I’ve last really read about the Finnish history prior to 1809 more than twenty years ago in school; the course about it in high school was cancelled due to lack of interest. I would’ve wanted it. Trauma-reminiscence over. I never got around to reading more about it afterwards.) But I’d heard a lot of good about the scenario, so what the heck, I played it last thing in the con. We had a map of Finland in the time, and two characters for each side. We didn’t receive any sort of an introduction to the historical situation from the GM other than what the mechanics implied: that there is war between Sweden and Russia and you’re here to negotiate peace and if you can’t do so, the war will go on, you will be punished, and someone else has to do it. There was only one interesting thing about my character, but it had happened in the past and there was no reason to bring it up at the table. It did color how I played my character, though. I have no idea what the other characters were like, other than their interests and occupations. I don’t know whether it’s because of the players or the game. Because once the game got going, everyone was focused on negotiating the peace and inventing fictional details about peace talks in a war nearly 300 years ago. We were instructed to be unreasonable, but I was the only one to even try that. It could be that the other characters didn’t have anything written in their nature to complicate matters. Or it could be that the players couldn’t or didn’t want to complicate things. Or it might be that the mechanics are partly to blame. The mechanics of the game are faulty, but show great promise. The main fault was that there was a) nothing mechanically to encourage the players to make bad decisions and reveal who the negotiators really are, and b) everything to encourage diplomacy and co-operation. First off, the game had rewards and sort-of-punishments. If you were being reasonable, the opposite side could award you a point in diplomacy that could be used to re-roll your dice. But if you made a mistake, your partner could punish you with a fault point, which somehow affected your destiny in the end; I don’t know because none of us made any mistakes. This alone was enough to guide play towards being diplomatic and reasonable, the very opposite of what the character sheet instructed us to do. The mechanics of the negotiations as such were really admirable. After we introduced our characters, we had to point out the one we saw as the greatest threat. It set the mood, alright, but it didn’t last; mechanically it affected how many issues each player was dealt. And the game revolved around issues, each linked to a die. Everyone brought one or two abstract issues to the table: mine, for example, was “A ludicrously small detail”. We were given 30 minutes to resolve all seven issues. We had to invent the issue based on the abstract description and then try to negotiate it. When the issue was dealt with, the originator of the issue rolled the die designated with the issue, then added it to the die tower at the center of the table. If the tower fell, the negotiations fell through because of you and all the issues returned to the table. If you threw a 1 on the die, you could give it to someone else to place in the tower; if you threw a 6, you could start a new tower; all other numbers determined how many Finnish houses burned down while we were talking — it was neat color. And building the tower was a really nice and exciting touch! Now, there was the time limit of 30 minutes. None of the other players really wanted to be undiplomatic. We had seven issues to deal with and nothing, as players, to gain from being unco-operative other than it maybe being fun. As a result, the characters ceased to exist. There was no conflict, nothing exciting (other than the die rolls), just this bland co-operative effort at coming up with fictional details about a real historical situation. None of us knew enough about the historical situation to make it feel like anything other than “Sweden and Russia talking about how to divide up Finland and the Baltic countries.” It felt frustrating. I left the table thinking that it would have been better to make it a war in a fantasy land or a sci-fi galaxy or whatever; now the historical bits didn’t matter one bit and at least in a fictional setting you would be free to come up with anything you like. I wanted to like this and I admire the mechanics, but I have little good to say about what happened at the table. It didn’t feel like peace talks and it didn’t feel like a roleplaying game. I’m willing to read the scenario once it’s out and see what went wrong. This year, the GMs only read the games at the table. They were given fifteen minutes to do so. I kind of liked the practice, but it they keep it next year as well, I have a wish to the designers: give the players something to do while waiting. Ideally, the GM can talk a bit about the game first, then give the players something to do, then read the rest. Especially if there’s a historical setting, you can give them something to read. The cool thing about these short games is the brevity of character descriptions. It’s clear you can do very much with very little, and overall I’ve become a fan of very effectively written characters. Maybe some people get a lot out of a detailed back story, but mostly I want to know what the characters are, and do, and feel, and decide, rather than what they did before the game even started. I don’t get too much out of characters small talking about their occupational history. Half of the games — Annetaan hyvään kotiin, Härmän raitilla, Uudenkaupungin rauha käsissämme — gave the GM very little, if anything, to do after the game was on other than explain rules and keep time. It’s not necessarily a bad thing, just an observation. With players new to roleplaying, they can, of course, guide those who don’t know what to do. Humorous games seem to work best when the starting situation is light enough to warrant comedy and you leave the job of actually creating the comedy mostly to the players. Force-feeding comedy probably never works. And some of the stuff you put on paper that’s hilarious to you (especially 30 minutes before the final deadline) is to other people probably the equivalent of a chainsaw to your scrotum. 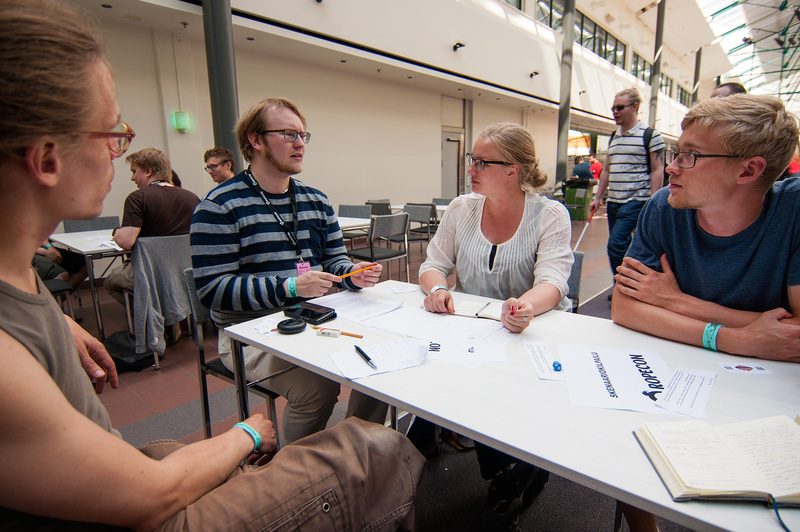 This entry was posted in Events, Game Design, Game Session Debriefing, Reviews, Roleplaying Games, Ropecon and tagged design, humor, humor games, Mechanics, Ropecon 2016, scenario competition, scenario contest, short-form by Ville Halonen. Bookmark the permalink.